Northwood Asst. in Oct. 1909 Butler Bros. Ad. October 1909 Butler Brothers Wholesale Catalog Ad showing the Lustre Flute hat shape. The date and “hand” drawn in were done by the late Frank M. Fenton. LUSTRE FLUTE Nappy - 2.25 in. high x 5.25 in. wide. 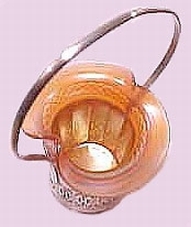 Bonbon: The two-handled bonbons are in essence, re-shaped using the open sugar mould. 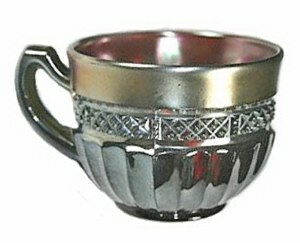 Custard Cup: (marketed as such) but called punch cups by some, although no punch bowl has ever been found. Ruffled Bowl: These 5”-6” berry size bowls are quite scarce. Single Handled Nappy: This pleasing little shape is obviously formed from the cup mould. Ruffled Hat Shape: fashioned from the tumbler mould. 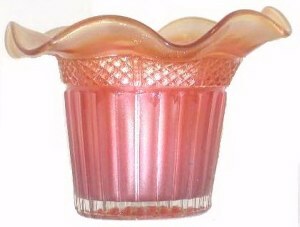 Ruffled Hat Shape in metal basket: Further evidence that producers of metal containers purchased certain glass examples to compliment sale of their metal wares. Amethyst, green and marigold are the only reported colors found on shapes mentioned. Green examples usually have the Alaskan iridescent treatment with lots of gold overlay. Amethyst examples in any of the shapes are quite difficult to locate. The pattern overall does not generate much collector excitement, although most examples carry the Northwood trademark. 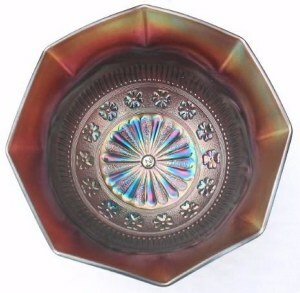 VERY scarce Nutbowl shape ROSETTE in amethyst. This is a ftd. 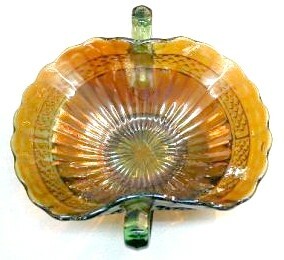 bowl with RUFFLES & RINGS Exterior pattern.4 in. tall x 6.25 in. deep. 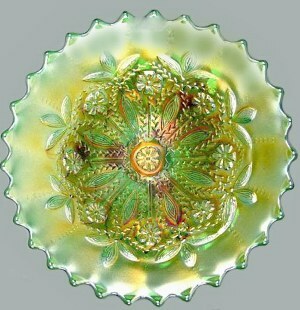 HEARTS & FLOWERS PCE Bowl: These pie crust edge bowls in 8”-9” size are found in marigold, amethyst, green, cobalt blue, white, ice blue, ice green, lime green. The pattern is certainly one of the favorites among collectors! 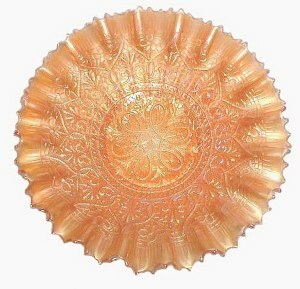 The pie crust edge bowls are much harder to find in any color than those bowls with eight ruffles in this pattern. Marigold is the most prevalent color. A 1912 Butler Bros. Wholesale Catalog ad showing Northwood products displays a ruffled bowl and compote in this pattern. ROSETTE: Amethyst is said to be more available than marigold or green in this pattern. However, this “mold shape” or “nutbowl” is rather unusual. 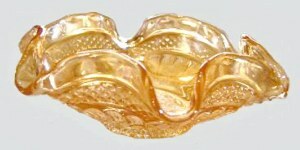 Most Rosette bowls are eight ruffle variety. Limited color range indicates the production era to be 1909-1910. 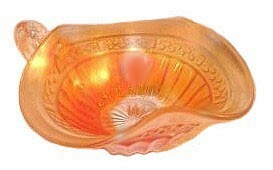 By clicking on - - in our pattern index, you can see a lovely marigold bowl and some additional text concerning these 7”- 8 1/2” bowls. INTERIOR POINSETTIA: Marigold tumblers turn up once in awhile, although no pitchers have been reported. As you would expect, the design is on the interior of the tumbler. LOVELY: There are those who would say that this design is not of Northwood origin because the characteristics of the design are centrally located as are Dugan designs. Then we come to deal with the Leaf and Beads exterior, which is from Northwood. Lovely is a very rare pattern with probably more green examples known than either of the other colors; amethyst and marigold. Dugan made precious little green in their carnival offerings. Combined with Leaf and Beads, Northwood may have decided this obscure Lovely pattern would lend competition to early Dugan designs in the marketplace. Most of the known Lovely examples are round and flared. Only triangular shape bowls have been found in amethyst color. Click on - - in our pattern index to view an example. 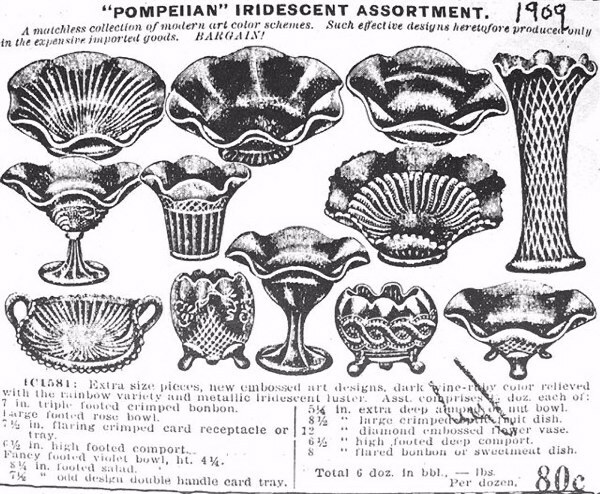 These three color offerings would indicate a production period of around 1910. 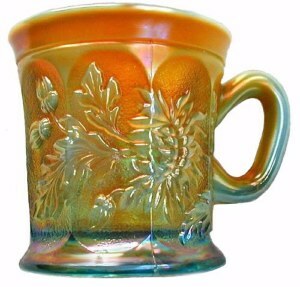 DANDELION MUGS: Stippling is always a plus for any example of carnival glass, it seems. What significant benefit it offers over and above a smooth background, we might question. Frank Fenton once revealed that with the constant cleaning of moulds, scratches and damage occurs. The last resort before replacing or “sidelining” that mould, the stippling was applied for extended use! 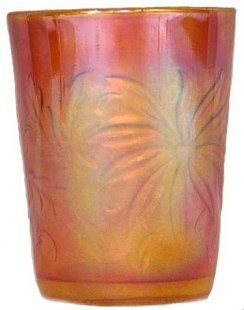 Amethyst seems to be the most often found color in this pattern, with Aqua Opalescent somewhat more scarce to locate. Green mugs are rather scarce as well. 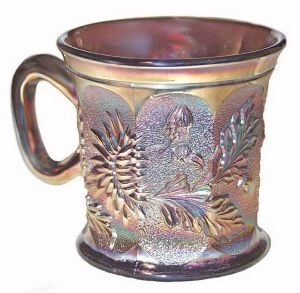 By clicking on - - in our pattern index, you can take a look at a very pretty green mug, and read the text surrounding Knights Templar mugs in the Dandelion pattern. Craftsmen and spiritual leaders alike are to teach others. Not only did Bezalel have the authority to command, but he was to instruct others. Monopolizing either craftsman skills or spiritual insights is never advisable. Those who have been given knowledge should share it with others.